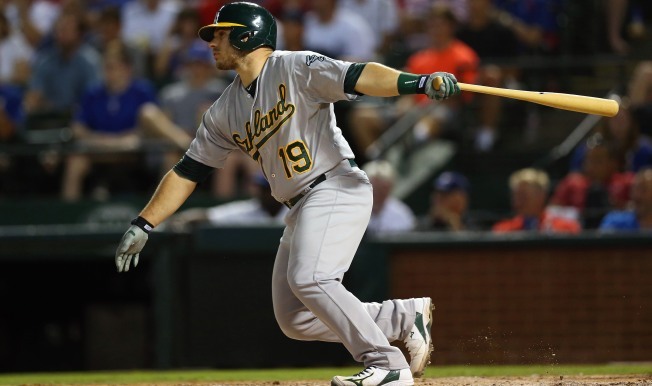 Josh Phegley homered and had a two-run double, Ben Zobrist also went deep and the Oakland Athletics beat Texas 8-6 in a series opener Tuesday night. Phegley's double chased rookie Chi Chi Gonzalez (2-2) and tied the game at 5 in the sixth. Phegley scored on Marcus Semien's RBI single to put the A's ahead to stay. Oakland is 18-11 since being 16 games under .500 on May 22. Rougned Odor had a two-run homer among his three hits for the Rangers, who have their first three-game losing streak since May 14-16. Elvis Andrus drove in two runs and scored early on a passed ball against Phegley. Athletics starter Jesse Chavez (4-6) allowed five runs and eight hits over five innings. The right-hander struck out three and walked two. Drew Pomeranz, the fifth Oakland pitcher, got the final five outs for his first career save. Gonzalez had allowed only three runs in his first four major league starts, but gave up six runs in 5 2-3 innings against Oakland. The 23-year-old right-hander's ERA basically tripled, from 0.90 to 2.27. There was a moment of silence before the game for MLB Network analyst and former player Darryl Hamilton, who was killed Sunday. Hamilton played 13 major league seasons, and his only one in Texas was in 1996 when the Rangers won the AL West and went to the playoffs for the first time. After Phegley's fourth homer of the season in the fifth made it a 2-1 lead, the Rangers scored four times in the bottom of the inning. They had scored only six runs combined the previous four games. Odor's homer made it 3-2 before a sacrifice fly from Adrian Beltre, who in somewhat of a surprise was activated from the disabled list before the game. He had missed 19 games with a sprained left thumb and it still hurts to swing the bat. But the A's immediately responded with four in the sixth, including Ike Davis' RBI double before Phegley's tying double. Zobrist's fifth homer of the season was a two-run shot in the seventh. He has hit .419 (13 for 31) with 15 runs, three homers and 10 RBIs over his last nine games. Oakland rookie center fielder Billy Burns has a career high 13-game hitting streak, and hits in 25 of his last 26 games, after a single in the third inning. Rangers: OF Josh Hamilton (strained left hamstring) is set to start a rehab assignment Wednesday as the DH for Double-A Frisco. He then will go to Triple-A Round Rock and could rejoin the Rangers by Monday. Athletics: C Stephen Vogt was out of the lineup after getting a cortisone shot in his left elbow following Sunday's game. Manager Bob Melvin says Vogt is expected to be back in the lineup Wednesday. ... Switch-pitcher Pat Venditte (strained right shoulder) could be cleared to play catch by the end of the week. Rangers: Texas has lost four games in a row only once this season (April 27-May 1). The Rangers have won the last six starts by left-hander Wandy Rodriguez (4-2, 3.20 ERA). Athletics: Oakland goes for its eighth win in 10 games. Right-hander Kendall Graveman is only the second A's pitcher since at least 1914 to throw at least seven innings and allow two runs or less in three consecutive games without a win in such a span.